Bentley Fragrances takes a step forward with a vibrant new scent: Bentley Momentum. Joining Bentley for Men and Bentley Infinite, the luxury automotive brand’s third pillar matches an assertive, bracingly masculine fragrance with a sleek, modern presentation. Matching sleek scent design with exceptional materials, Bentley Momentum meets the same exacting standards as Bentley cars. In this new, forceful composition, the renowned master perfumer Nathalie Lorson creates excitement by contrasting aromatic freshness with potent, vibrant woods. As the fragrance opens, a splash of aquatic notes energises sparkling bergamot and cool green violet. In contrast to this refreshing style, clary sage adds herbaceous, aromatic accents, hinting at the sensuous warmth that unfolds in the heart notes. The new fragance comes in two intensities, each with its distinctive olfactory design: Bentley Momentum Eau de Toilette and Bentley Momentum Intense Eau de Parfum. Along with a higher, eau de parfum concentration, Bentley Momentum Intense builds up the intensity of the composition with new ingredients that heighten the contrast between top and base notes. Elemi, a resin with green, zesty and peppery facets, spices up a cool aromatic accord of lavender and geranium. Cutting-edge woody ambery notes boost the vibrancy of the blend. 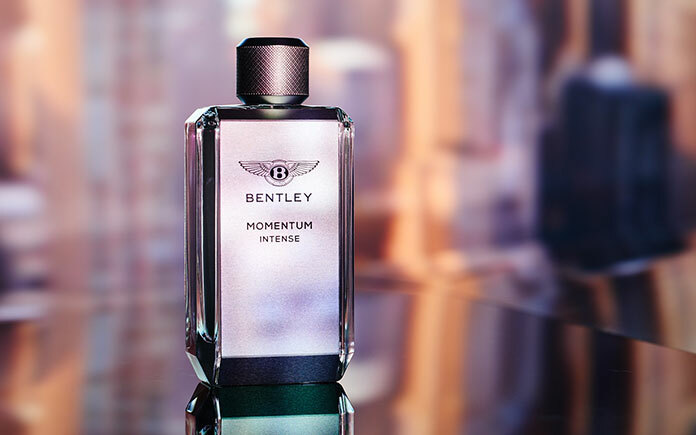 Inspired by New York’s soaring, vertical skyline, Bentley Momentum’s bottle design reflects its assertive notes. Tall, rectangular and faceted, it is made of luxuriously heavy glass. The front and back are covered with silver brushed-metal plates, printed with the iconic “Flying B” Bentley logo and the name of the fragrance. Light silver for Bentley Momentum, these plates take on a darker shade of silver for Bentley Momentum Intense.